If leopard print was all over catwalks last fall, snakeskin is the print du jour. 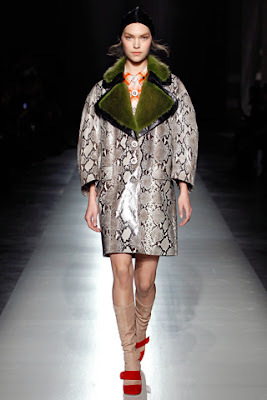 Prada pioneered the trend with snakeskin coats and boots (may I say - not my favourite items this season!). So if you must inject reptilian vibe into your wardrobe, you could go for a classic snakeskin clutch. I'm in love with Cala python clutches. They come in variety of colors and two sizes: PM and slightly larger GM. At £150 and £185, think they are both sensible investments and won't go out of style after this mad reptilian season :). Oh and I'm hearting the above gorgeous courts by Zara! I would wear them with monochrome black outfit. 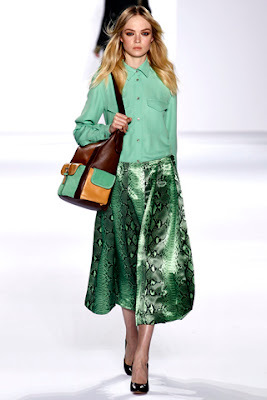 I could also see some appeal in snakeskin print 70s frocks and blouses, as seen in Chloe Fall/Winter collection. Marks and Spencer stocks gorgeous Chloe-inspired silk dress.